Sagebrush, Artemisia tridentata, is also known as Chamiso. The aromatic, soft, and green grey coloured leaves are a ceremonial herb of the North American Indians. Partially dried leaves are bundled and burned to cleanse the spirit and welcome positive thoughts. Purifying fumigant. 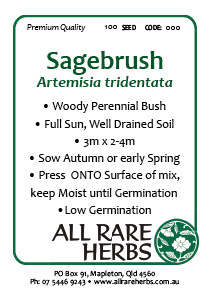 Sagebrush is native to western USA and Canada. Prefers light, dry, well drained soils, in an open sunny position. Yellow flowers from spring to summer to 2m. Drought and frost resistant. A woody, perennial bush. Note: Seed is inextricably mixed with other dried plant parts. Seed count is given as an approximate guaranteed minimum..
Be the first to review “Sagebrush, seed” Click here to cancel reply.